Disney’s ‘Visible Light Communication’ Seeks to Make Toys Talk to Each Other via LEDs @DisneyResearch « Adafruit Industries – Makers, hackers, artists, designers and engineers! 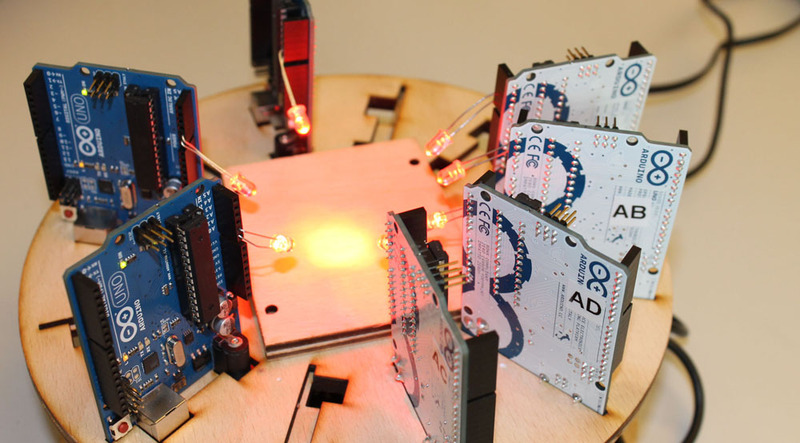 While the image below is of an array of Arduinos – not commonly thought of as ‘toys’ – there is a fun video on the bottom of Disney Research’s Visible Light Communication page that shows various LEDs ‘communicating’ with one other, some embedded inside toy cars – and even a dress! Light Emitting Diodes (LEDs) are used in consumer electronics, toys, light bulbs, cars, and monitors. With LEDs, it is possible to control light brightness at a frequency much higher than conventional light bulbs: LEDs can be switched on and off at very high rates. As result, LED-based lighting can be used for wireless communication services by modulating the intensity of the emitted light. Further, LEDs can also be used as receivers just like photodiodes. We call this concept Visible Light Communication (VLC) with LED-to-LED networking. Significant research contributions have been achieved by Disney Research in the area of networked systems for VLC. VLC creates opportunities for low-cost, safe, and environmentally friendly wireless communication solutions. We focus on connected toys and light bulb networks. Our work targets a full system design that spans from hardware prototypes to communication protocols, and applications.